Has lack of confidence cost you your career? 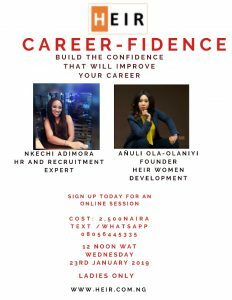 Would you like to have a better career footing this 2019 with an improvement in your self-confidence? 1. Text/WhatsApp the number 08056445335 and reserve your space. 3. Once payment is confirmed, a confirmation of space will be sent to you. 4. You will receive a link to join the session accordingly. This entry was posted in Continuous Development and tagged career advice, career goals, confidence, Employability Skills, Human Resource, interview skills, leadership skills, opportunity, transferable skills. Bookmark the permalink.